It’s before dawn on a Saturday morning, you are packing the last cooler full of salad and the hinge breaks. If it isn’t one thing, it’s another; the ever spinning wheel of a tractor in the mud. You silently wish that you could grow money as a row crop. For 10 years, I was primarily a CSA farmer. 95% of my income came in the form of shares. My shares received the girth of my bounty, but inevitably I would have an overabundance of something. Usually my sugar snap peas. I would have heaps of extra and thought, “I’ll sell these at the market!” So, off we would go to the market with pounds of perfect peas, a handful of perfect bok choy, and some bags of a delicate salad mix. We would stand there under our 8×8 stand and people would pass us right on by. I didn’t get it. One day, my husband decided to bring our vintage snow cone machine and make locally sourced fruit syrups. Our stand was packed and while they were there drooling over the snow cones, they bought peas as well. That was the day I realized that there was a method to the madness. In order to sell, you need to attract. Here are 12 ideas that are guaranteed to grow your profits at the market. Personality: To begin, the very first thing you are is a farm. You are your logo and your own unique expression of one of the oldest respected professions. Be proud. Be visible. Brand yourself with T-shirts that display your farm. If you can make people laugh, even better! Some people will keep coming back just because they like the farmer! Space: The foremost important choice you can make as a market grower is the length of your booth, according to Wyatt at Red Wagon Organic Farm in Boulder, CO. The longer it takes the consumer to walk past your booth, the more chance you have of them stopping. Twenty feet is an ideal length for a booth. Law of Attraction: Create an eye catching booth-front. Stack roots in high and neat piles. So high that it looks like edible art. People will stop and take photos of the impressive display of deep red beets, tricolor carrots, or snow white Hakurei turnips. Ideas for Use: “Turnips, you say? What do you do with those? I have never tried a turnip.” First of all, not all turnips are created equal. The Hakurei strain is by far the tastiest turnip out there (and the most expensive seed, which may keep some farmers at bay.) You can eat them raw, roasted, fried, grilled and the greens are delicious and one of the most nutritious greens on the planet. Samples: How do you get a newbie interested in turnips? Slice them up, stand out front and offer them by the slice. Samples! Sample anything they want to try! Have a simple sample recipe printed out and ready to share for the more obscure veggies. Check your market rules first before you offer any produce. Abundance: Do not display a small amount of something. A few handfuls of basil will be confused for display and the customer is unlikely to buy them. Nobody wants to be the one to buy the last. Keep your booth fully stocked all the way through the day so that even the last shopper of the day gets a sense of abundance. Shop-ability: Customers will only fill their arms with what they can carry so provide bags or baskets so that they can fill up. Hang them from the rafters of the pop-up tent, hand them out. Leave bags near the loose greens and baskets near the melons. Make it shop-able and the customers will be unstoppable. Freshness and Cleanliness: This, for me, is of utmost importance. Wash the produce well enough so that the customer can snack all the way home without chewing a single piece of grit. If the vegetables look limp and sad and covered in soil, they are not whispering “eat me.” Keep them moist or misted, alive, vibrant, and out of the sun. Use false bottoms so that the salad is always full, and never a wilted and smashed mess at the bottom. Display: Leave veggies pouring from baskets, cornucopia-style, for photoshoots. Use of space is crucial. Ideally, the rectangular plastic lugs (used for berries usually) are stackable and neat. Similar shaped alternatives abound. Circular containers leave emptiness, avoid them. Keep it simple and go vertical with simple shelves for space constraints. Height is attractive. Get Them Home Safe: Plastic bags have their place. They help greens stay crisp and fresh, especially on a hot, dry summer day. Encourage people to bring their own reusable bags by offering an incentive (such as 10 cents off) but always provide. Flower Power: Do you sell flowers? You should! Fill the corner of Ziploc bags with water, stick in the stems and wrap a rubber band tight around. Or, wrap a wet paper towel around the bottom of the stems and stick them in a produce bag. Give them some tips to lengthen their time in a vase, like cutting the stems and changing the water. Help them preserve your precious harvest. Bonus – Uniqueness: Aim to bring five things to market each week that no one else is bringing. But do not try to bring tomatoes in April. The cost of trying to grow things out of season is usually a fruitless endeavor. This unique produce could be a green no one is growing, like my personal favorite, Sorrel! It could be a new variety of cilantro, the eclectic tomatillo or ground cherry, an herb like thyme or sage, a Thai variety of basil, or something with a fun name like Egyptian walking onions. There you have it! No rocket science. No smoke and mirrors, simple, effective, proud, and delicious. This article first appeared in the Summer 2016 issue of New Farm. 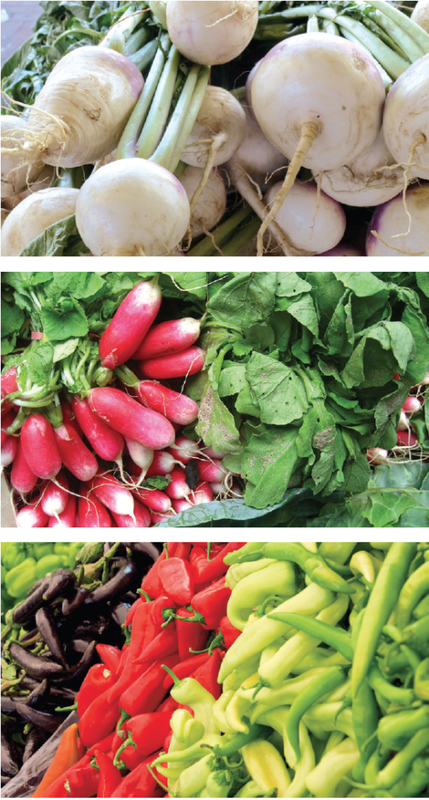 New Farm is a quarterly publication free to members of Organic Farmers Association. Sign up today. Megan Henderson is a freelance writer and the owner of Blue Flax Farm in Victor, Idaho.